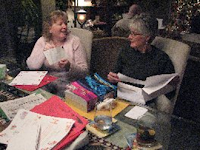 Optimists throughout the United States and Canada took turns helping with Christmas cheer. One of the most popular Christmas-related activities was Christmas tree sales. Many Optimist Clubs use the profits from Christmas tree lots as their budgets for the year. It's not unusual for a small club to raise as much as $25,000 in a little less than three weeks. One hundred percent of all profits are then returned to their local communities in the form of scholarships, youth programs and community projects. are helping Santa write Christmas letters, wrapping presents, collecting and delivering food baskets, sponsoring a local headquarters for Santa photos, hosting breakfast with Santa and by providing warm coats and shopping trips for kids. Please share photos of your Club's Santa project by sending your pictures to the PNW Blog. Best wishes to you and yours for a happy holiday and joyful new year. They might not be straight-A students. They might not be celebrated athletes. But they are kids who make a difference just by being members of the community. Perhaps she's the girl that helps out at the soup kitchen, or he's the boy that works extra hours to rake leaves or shovel snow; or they take time to help a classmate with schoolwork or at recess. 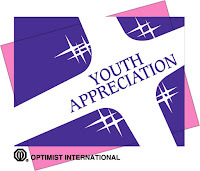 The Jerome Optimist Club celebrates these special kids for their efforts every year with the Annual Youth Appreciation Awards. This year the ceremony will be held on Wednesday, November 5, 2008 at 6:00 p.m. at Summit Elementary in Jerome, Idaho. Nominations are received from the community; from teachers, parents, and friends. Nominations are due on Wednesday, October 29, 2008. You can nominate someone special in Jerome, Idaho or the surrounding area today by contacting Sheri Mitchell. According to Lt. Governor Bertha Washer, it is her favorite event of the year: the Ghost Ridge Haunted House. In addition to being a fund raiser for the Meadow Ridge Optimist Club, Ghost Ridge provides an opportunity for high school students to gain work experience by setting up the ghostly event, working on site during the event and tearing down afterwards. The theme for this year's annual spooktacular is "Something Wicked." You are invited to enjoy the fun from October 24 through October 30 at the Maple Ridge Fairgrounds, 23448 -105th Ave. & Lougheed Hwy. Cost for adults: $7.00 for the Ghost Ridge Haunted House. Cost for children: $2.00 for Ghost Ridge. 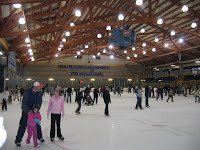 Groups that benefit from the proceeds are: Maple Ridge Pitt Meadows Agricultural Association, Royal Canadian Air Cadets Squadron 583, Meadow Ridge Optimist Club, and the Ridge Canoe & Kayak Club. Boo! Who can bring about change in Washington? It's an historic election year. Normally, I would refrain from posting a political message, but this one is important. Enter your name below to see why. 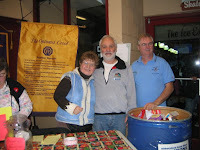 The Optimist Club of Vancouver North Shore, BC celebrated their fiftieth anniversary on October 7. Newly installed President Mansuralli Lalani led the celebration with a dinner party at Cheer's Restaurant. 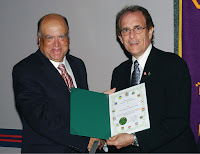 Mr. Lalani (left) received a certificate to commemorate the club's service and history from MP Don Bell (right). According to the North Shore News, the Vancouver North Shore Optimist Club encompasses programs and activities directed toward assistance to youth and the improvement of the community. They put forward Optimist International's mission of bringing out the best in kids. 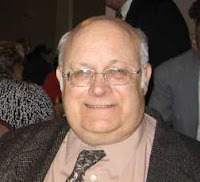 Founding member Larry Krangle attended with his wife Lorna. Dawn Copping and Mel and Millie Johnson greet guests as they arrive. Singer Camille Johnson entertains those in attendance. 'Tis the season for all Optimist Clubs to pass the gavel forward to a new leader. My friend Buzz Buswell from the Tennessee District shared a story with me about the transfer zone. In relay races, the transfer zone is the ten meters before and after the stationary runner who stands waiting to receive the baton from the moving runner. The hand-off is blind and without looking back, the departing runner receives a signal from the approaching teammate and begins running with his arm extended straight back to receive the baton. The approaching runner firmly places the baton in his teammate's hand, but continues to hold until the departing runner takes the baton from their grasp. All of this happens within the transfer zone. All of this has to happen in order for the team to win. According to Buzz, the end of one Optimist year and the beginning of the next is like that transfer zone. In order for your club to succeed, you have to support and encourage each runner - each leader - to grasp, run and hand-off that baton in sync. Buzz ends his story by saying, "We are in a continuous relay race for the children of our communities. Maintain your drive, look ahead, pass the gavel and keep going for all you are worth. A year from now, you can pass the gavel to your teammate with the knowledge that we are all in this together. It's not your year or my year. It's another fine year to be an Optimist." Above: Retiring president Michelle Cox swears in Pamela Schmidt at the Auburn Optimist Club Installation Ceremony. 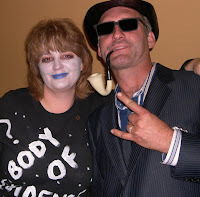 Pictures left to right: Tracy and Scott Brandenbourg accept their roles as Lt. Goveror and Club President at a Clue-themed installation banquet for Jerome. 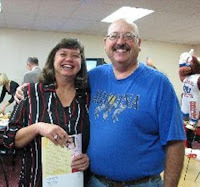 Cindi and Ken Wall of Boise Noon attend their first meeting as another Club President and Lt. Governor team. Sue Thompson presides over her first Meridian Optimist Club meeting as president. 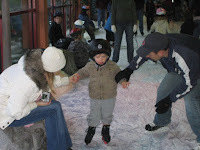 Please send us your photos so we can add them to our page! October 1 marks the beginning of new year for Optimist International and the Pacific Northwest District. Clubs throughout North America, the Caribbean and abroad change presidents, districts change governors and the organization recognizes a new International President. 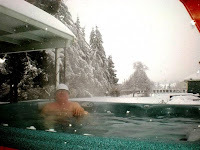 Here in the Pacific Northwest, duties were entrusted to 2008-2009 Governor Peter Smith. Governor Peter has chosen the theme "Dream Makers" to express the behind the scenes roles played by so many Optimists for the children they serve and for the special people in our lives that help us reach for our goals. 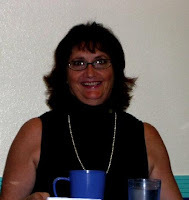 Peter's personal dream maker is his VIP Annette Smith. Our congratulations to all officers who proudly accepted their positions and a special thanks to those retiring from their posts, especially Steve Andersen, 2007-2008 Governor. We appreciate the hard work you've done and the great work yet to come. Thank you for your service to your community and your fellow Optimists.